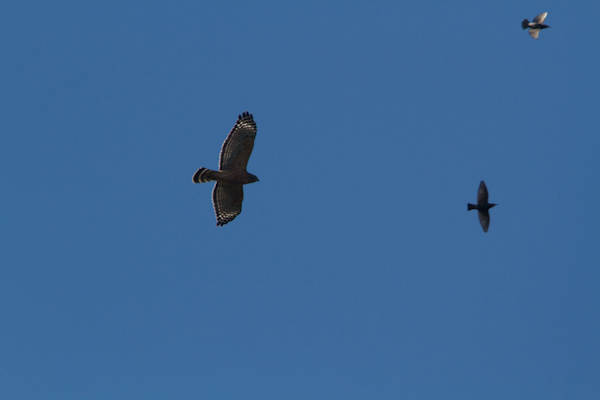 Just thought I’d stick up this short collection of shots I got the other day of a Red-shouldered Hawk. 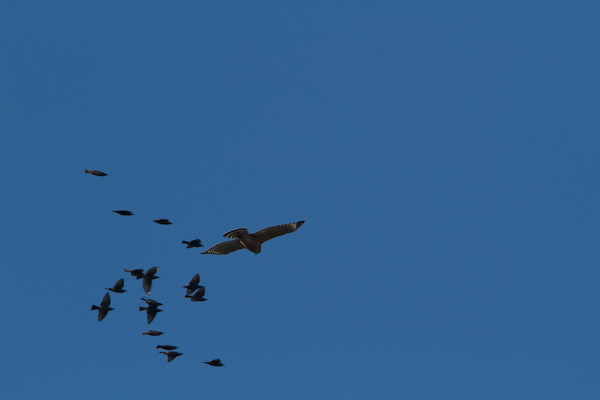 It essentially spooked up a flock of European Starlings. Although small mammals are typical prey of these rather beautiful buteos, these birds do sometimes take small birds especially around feeders in winter and I guess the European Starlings recognized this bird as a threat. Rather than really mobbing the hawk, the Starlings took the rather smart decision to try and stay directly above the hawk. Although more atmospheric than crisp shots I thought the snaps rather nicely illustrated a couple of the key identification fieldmarks of this species including the banded tail and the pale ‘commas’ on the outer primaries. It also nicely highlights a regularly observed phenomenon in the world of raptor ‘dogfighting’. 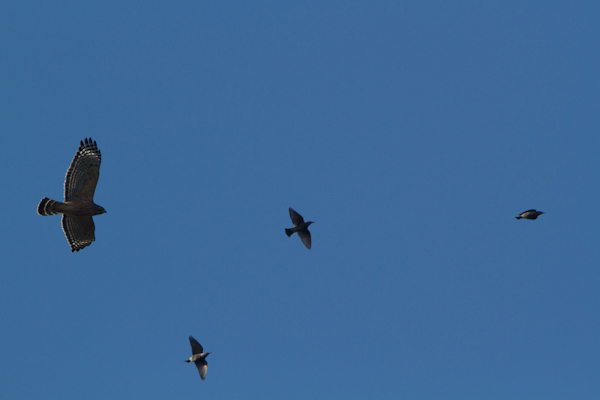 As with swallows and smaller raptors the Starlings having made the smart move of trying to climb up above the potential threat, to prevent the raptor launching a diving attack. Anyway I was pretty happy with how the shots turned out, hope you like them too.